(CNSNews.com) – Against the backdrop of a large American flag hoisted between two fire trucks, President Trump and Vice President Mike Pence in the early hours of Thursday morning welcomed home three Americans freed by North Korea during Secretary of State Mike Pompeo’s visit to Pyongyang. The President and First Lady Melania Trump arrived at Andrews Air Force Base, Md. on Marine One shortly before Pompeo’s aircraft landed. A second official aircraft then landed, this one carrying Kim Dong Chul, Tony Kim, and Kim Hak Song. The President and First Lady entered the second aircraft, while Pence and Pompeo waited at the bottom of the stairs. Minutes later they exited the plane with the three freed Americans, who smiled, waved, and making V for victory signs with their hands. “It’s like a dream,” Kim Dong Chul told reporters, speaking through a translator. Trump said he appreciated that Kim Jong Un had allowed the three to leave before the summit being planned between them. Trump also paid his respects to the parents of Otto Warmbier, the American student who died just days after he was released from a North Korean prison and returned home in a coma last June. Pompeo, who traveled to Pyongyang over the Easter weekend – while still CIA Director – flew there again this week to secure the release of the three men, as well as Kim Jong Un’s approval of the date and venue of the upcoming summit. Earlier, the three Americans issued a brief statement through the State Department. 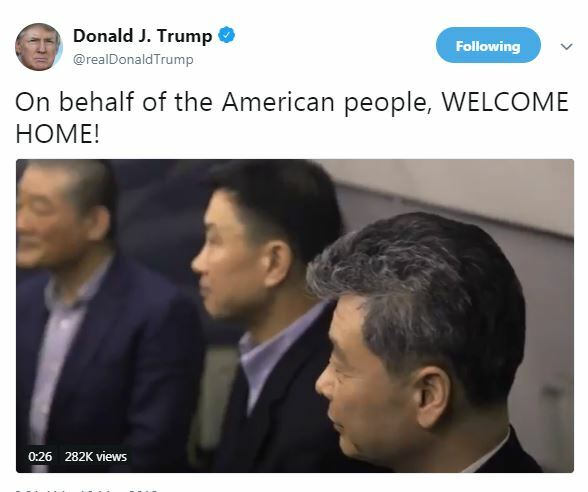 “We would like to express our deep appreciation to the United States government, President Trump, Secretary Pompeo, and the people of the United States for bringing us home,” it said. Tony Kim, 59, a teacher at a private university in Pyongyang, was detained at the city’s international airport on April 22 last year, and was accused of “criminal acts of hostility” against the Stalinist regime. Kim Hak-Song, 55, another academic at the same university, was detained in May last year, on suspicion of committing “hostile acts” against the regime. Businessman Kim Dong Chul, 64, was arrested in 2015, charged with subversion and espionage, and sentenced in April 2016 to 10 years’ hard labor. Before Pompeo departed the Korean peninsula, Tony Kim’s family issued a statement of thanks. “We are very grateful for the release of our husband and father, Tony Kim, and the other two American detainees. We want to thank all of those who have worked toward and contributed to his return home,” it said.